Jellyfish have always been adept in springing surprises at humans. One such surprise was encountered by a Jellyfish expert Lisa Gershwin in Tasmania. Lisa is responsible for the Jellyfish department of the local Museum and art gallery. 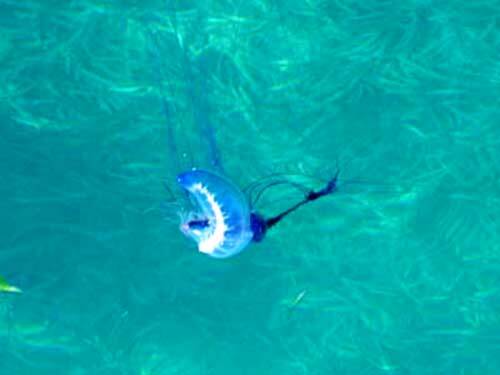 She was out swimming in Tasmania, near a local jetty, when she saw a Jellyfish with light being emitted from its body. This was her 159th discovery of Jellyfish. Jellyfish do not have any kind of pigments in its body which emit light. But the neon Jellyfish are just a creation of light reflection. The cilia or hair like extensions on the body of these Jellyfish helps them in loco motion. When the light falls on these cilia and is reflected back, there is a beautiful rainbow formation with the Jellyfish looking like as if it is self illuminated. But these neon Jellyfish are quite small, only 13 cms in length. The beauty of these creatures is quite short lived as they are very fragile and can shatter in to pieces on hitting a net. These neon Jellyfish are also called as Rainbow Jellyfish. They look as dazzling as a colorful Rainbow with their myriad of colors. It is a visual delight to see them at night or in dimly lighted waters. The rainbow colors glow so vibrantly in the background of the dark black waters at night.